We all know people love bad news. We love bad news. Why? It creates opportunity. As Buffett says “I will tell you how to become rich. Close the doors. Be fearful when others are greedy. Be greedy when others are fearful”. We love sentiment events or what we call ‘bathwater’ events, termed after the phrase “don’t throw the baby out with the bathwater”. Italy is in bad news territory and the markets, particularly the bond markets, are reacting accordingly. While many love to sprout that Italy is a basket-case, it wasn’t so long ago that Australia had four Prime Ministers in five years and Glen Lazarus, Clive Palmer, and tricky Ricky Muir held serious sway in our legislative process; and look at the White House where staff turnover is currently knocking up about 100% annually – it’s all relative. We, as real estate investors, are always tarred with the “bonds go up, real estate returns go down” brush. I put some empirical evidence around the refutation of that ‘sound bite’ some nine months ago in this Livewire article (Property goes down when rates go up, right?) – remember real estate is a great inflation hedge as we capture inflation, and usually more, in our lease structures. Italian bonds yields shot up a few weeks ago and the perceived logical causation is that Italian real estate must go down. We think broad brushes should be left in the shed when it comes to investing. We believe that there are various pockets of Europe that house ‘European real estate’ and require comparison on a larger geographic basis rather than on just a country specific basis. We put London, Paris, Madrid, Barcelona, Frankfurt, Monaco, Brussels, Hamburg, Berlin, Milan and Rome in this category. We view these as the gateway cities of Europe, where rental demand is increasingly being driven by multinational/pan-European companies. This is highlighted by Brexit which has resulted in financial services companies considering expanding in a number of these cities. Many people have stampeded the most iconic Italian real estate – the Colosseum, The Forum, The Pantheon, St Mark’s Square, The Duomo; and we’ve all been bombarded with somewhat frivolous articles over the years of how for the same cost of a 1-bedroom unit in Kirribilli we could buy a huge villa in Tuscany. 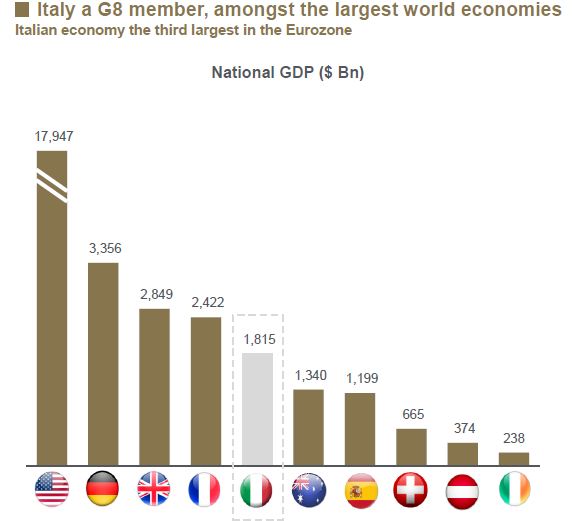 This is all nice tourism real estate but to put some relativity to the size of the real commercial market there’s 60 million people who live in Italy, it’s the third largest economy in Europe (see Chart 1), and regardless of the perceived trajectory, it is still an economy which is 50% bigger than Australia on a like for like dollar basis. All this output needs real estate to organise the factors of production, specifically office buildings and industrial/manufacturing properties. You may say “Italian real estate. You must have rocks in your head”. We say, “I don’t think so”. Italy is very much the tale of two countries. In the prosperous North (the Lombardy region), centred on and around Milan, unemployment sits at a respectable and low 7%. In the South on the other hand it’s a different story, particularly Sicily and Calabria where unemployment is 22%. Italy is not Greece. I toured a number of manufacturing plants in Lombardy two years ago and let me tell you there’s no shortage of hard, disciplined work being conducted and world leading engineering and manufacturing. Deutsche Bank’s survival (which was questioned late 2015 / early 2016). On our analysis and risk scoring, this was an over penalisation by the stock market for sound Milan based property assets with very strong supply demand fundamentals. Unfortunately, since the recent Italian bond ‘crisis’ it’s only gone down 50 euro cents. We’d hoped it would fall a bit more as we want to buy more. We believe higher Italian bond rates will precipitate balance sheet reshaping at some levels and cause the sell-off of some property portfolios held by banks, the government, and real estate funds. For a business like Coima that has been around since 1974, this will create the very buying opportunities they need to increase the scale of their REIT. Coima is run by a very astute and wily property investor by the name of Manfredi Catella who has previous careers with JP Morgan, Hines and Heitman – all competitors of ours in Australia that we have significant respect for. Coima has an approximately 600 million euro portfolio with 72% of that in Milan (and Coima has no exposure to the South of Italy). 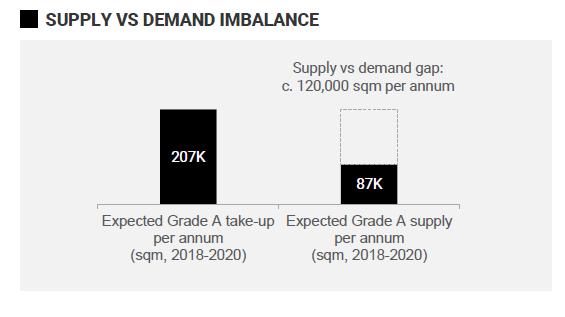 It’s a portfolio of high quality buildings, and due to their relative scarcity in terms of quality, Coima will be able to raise rents (see Chart 2). Milan A Grade office is in high demand evidenced by an exceptionally low vacancy of between 0-2%. At 0.7X Book Value and a Weighted Average Lease Expiry (WALE) of 6.9 years, we think it continues to look cheap. As a global investor we look at our positions all on a relative basis, and while I know that many Australian investors are getting excited about the Costa farms float in Australia, with a WALE of 8 years and no guarantee on rental step ups (and a highly susceptible ‘rental’ stream), in Tasmania and other locations, I’ll take the A Grade Milan office assets. 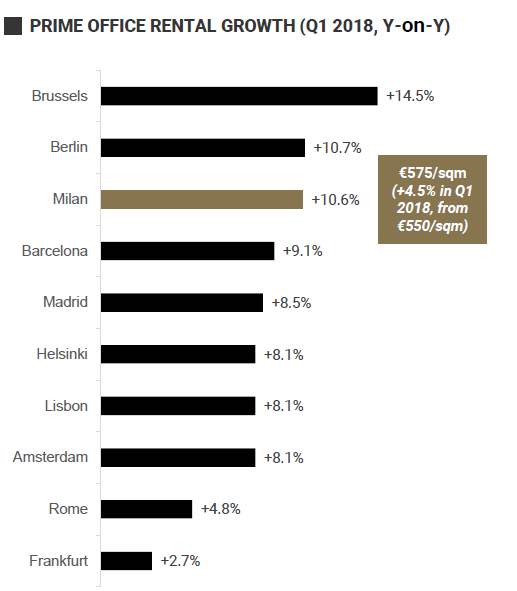 Over the past year Milan was in the Top 3 Western European Cities for office rental growth due to very limited quality supply; and there’s very little chance of supply catching up with demand when we analyse the physical markets (see Chart 3 and Chart 4). 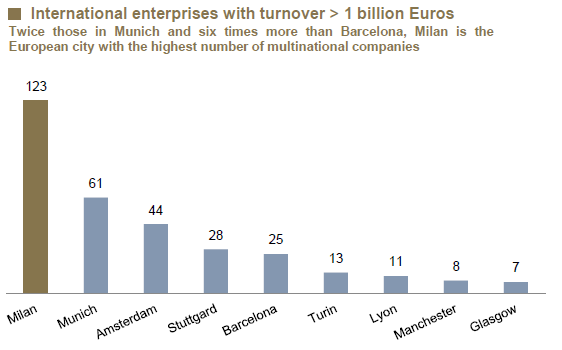 Lastly Milan is THE European city with the highest number of multinational companies (see Chart 5) and is for example the national headquarters of State Street, Google, Nike, Amazon, HSBC, Microsoft (all of which are housed in Coima buildings). So next time you’re headed off to the land of prosciutto and parmesan, shoot me a note and I’ll tell you which of these to look out for on the Milan skyline. The Fortius Global Value Property Fund continues to look to add to our other European exposures which have been impacted by the Italian woes, made even more attractive by the relatively weaker Euro.